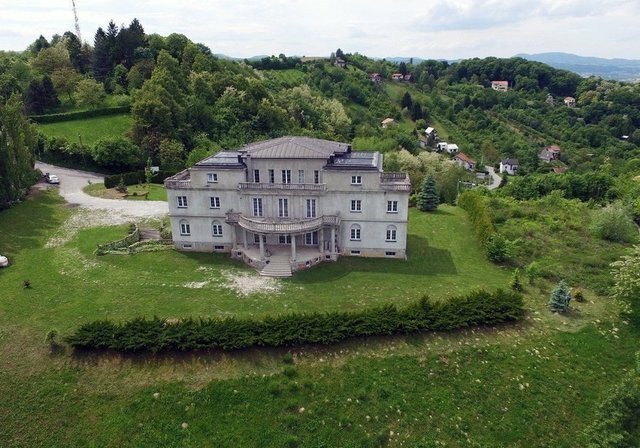 This stunning, uncompleted property is situated in an ideal location in a quiet small town of Sveta Nedelja. The town is located in a very attractive area, surrounded by the lowlands and the hills between the River Sava, as well as Okić and Samobor hills. It has been constructed on a spacious land plot covering an area of 5,780 square meters and comprises of four floors with a total gross area of 1,517 square meters. The basement covers a total gross area of 375 square meters and is ideal for wellness and fitness area, wine cellar or restaurant. The ground floor comprises of eight bedrooms, eight bathrooms, a living room area and a pantry which accounts for a total gross area of 361 square meters. The first floor covers a total gross area of 319 square meters and comprises of a kitchen, a spacious living room, eight bedrooms and a terrace with a marvelous view. The loft is currently used as a living space, and it covers a gross area of 147 square meters. It includes eight bedrooms, eight bathrooms and 2 terraces with a view over the town and almost pristine nature where you will particularly enjoy the sunsets. In addition to the main villa, there is also an auxiliary facility of 315 square meters consisting of 5 apartments. Each apartment has a separate entrance and consists of a kitchen, a living room, one bedroom and a bathroom and are intended for the staff. Most of the property is uncompleted, with the exception of a smaller part, loft, that is currently used for a living. This provides sufficient room for a new owner to adapt the property to meet their own wishes, needs or in accordance with their vision. The ideal location, only 15 kilometers away from Zagreb, the capital of Croatia, as well as the vicinity of the airport, exceptional traffic connections with other cities and the neighboring countries, are only some of the advantages of this property. Due to the beauty of the nature surrounding it and a rich cultural heritage, abounding in monuments, Sveta Nedjelja area is becoming an increasingly attractive destination for recreational and excursion tourism. In addition, due to the specific geographical features of this area, visitors can enjoy a broad range of recreational and sports programmes: recreational hiking trails along Sveta Nedjelja hills, cycling routes along the hills by the lakes, fishing, paintball areas, an adrenaline park, tennis courts, as well as birdwatching at the Ornithological reserve.